Speak to Garan Marethi or Fura Bloodmouth. 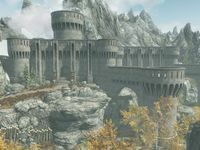 Kill the Dawnguard leaders at Fort Dawnguard. Return to Garan or Fura. After completing Kindred Judgment, Garan Marethi or Fura Bloodmouth in Volkihar Keep may offer this quest. You will be asked to kill the leaders of the Dawnguard to "avoid an all-out war". Upon nearing Fort Dawnguard in Dayspring Canyon, several Dawnguard members will turn hostile and attack you. Make your way into the fort. It is best to try and kill the leaders as stealthily as possible because in groups they can be difficult to defeat. Isran also uses a powerful spell called Stendarr's Aura that will drain your health if you come into melee range, but only if you are a vampire. Once you have defeated the leaders of the Dawnguard, return to Garan or Fura for your reward. He or she will congratulate you on killing the leaders of the Dawnguard, but comment that the Dawnguard will still remain active even with its leaders dead. All NPCs within Fort Dawnguard must be eliminated in order to complete this mission. There are eight in total: Agmaer, Beleval, Celann, Durak, Florentius Baenius, Gunmar, Isran, and Sorine Jurard. It is not required that you kill the Dawnguard members patrolling outside the Fort. During this quest, Isran is no longer considered essential and can be killed. You can use Calm or Pacify on Sorine Jurard and Florentius Baenius to buy the new Restoration spells[verification needed — see talk page] and bolts from them. This can be repeated until they are killed. Both Garan and Fura refer to Fort Dawnguard being in the Reach, when it's actually in the Rift. This bug is fixed by version 1.1.3 of the Unofficial Dawnguard Patch. Isran's "essential" flag might not get removed, meaning he can't be killed. Use the setstage console command to bypass this. 10 <Alias=QuestGiver> has sent me to destroy the Dawnguard leaders at Dayspring Canyon. 255 Finishes quest <Alias=QuestGiver> sent me to Dayspring Canyon where I destroyed the Dawnguard leaders. On the PC, it is possible to use the console to advance through the quest by entering setstage DLC1RV10 stage, where stage is the number of the stage you wish to complete. It is not possible to un-complete (i.e. go back) quest stages, but it is possible to clear all stages of the quest using resetquest DLC1RV10. This page was last modified on 12 August 2018, at 06:24.